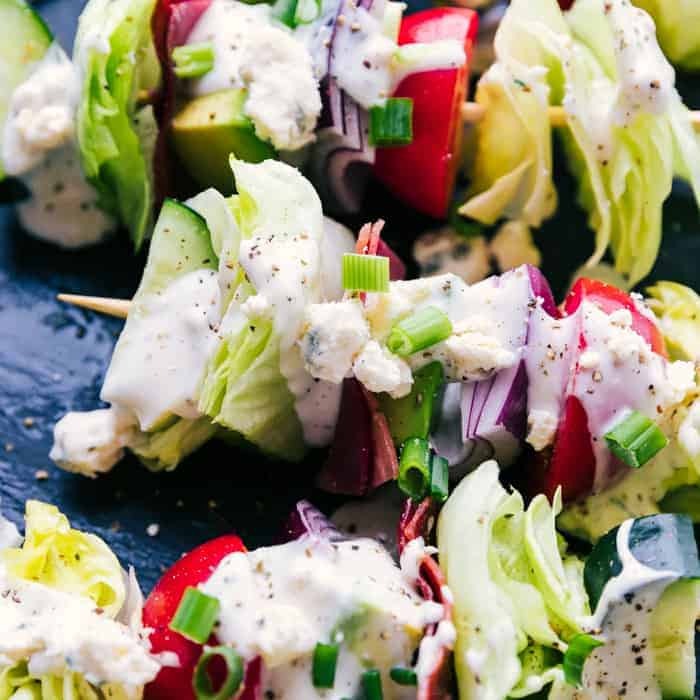 Wedge salad skewers are a classic twist on the traditional wedge salad and make the perfect appetizer or side served at any party. Add all your favorite vegetables and creamy blue cheese dressing and your set. Turn your salad into something fun with these simple wedge salad skewers. They make great appetizers for any party or backyard BBQ any time of the year. These wedge salads are made with iceberg lettuce, diced tomatoes, red onion, bacon, avocado and cucumbers. Each one is topped with crumbled blue cheese, diced green onions, and creamy blue cheese dressing, and every bite will have a crisp and flavorful taste for you to enjoy. Hi guys, this is Shannon from The Food Cafe and I am super excited to be back bringing you a fun appetizer for your New Years party or depending on where you live backyard BBQ bonanza. If you are need of additional appetizers for all your festivities you should also try these honey garlic meatballs or spicy sausage cheese balls. A wedge salad consists of a wedge of iceberg lettuce topped with various toppings and blue cheese crumbles and blue cheese dressing layered over the top. 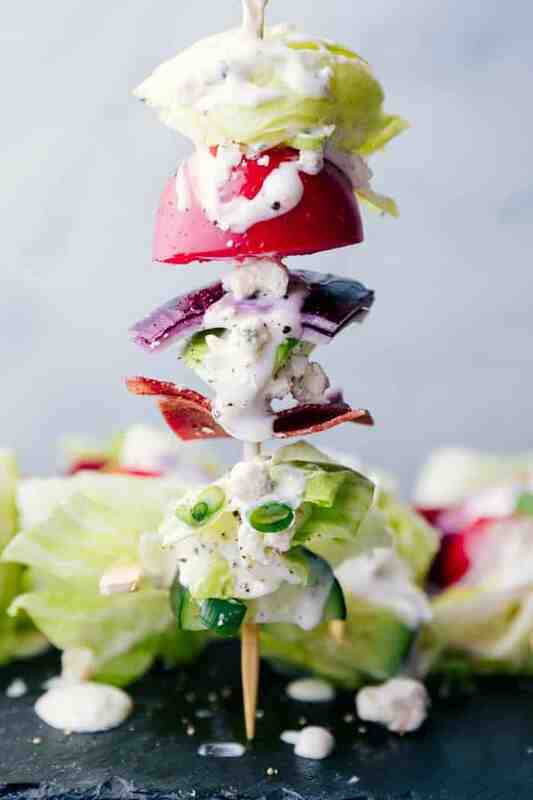 How do you make a wedge salad skewer? Rinse, dry, and slice all ingredients and set aside. Cook bacon until just crisp and cut into thirds. 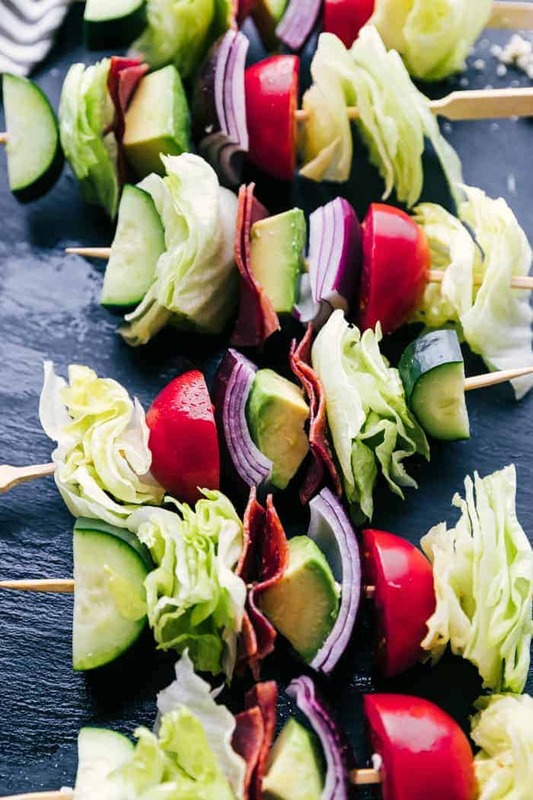 Using wooden or metal skewers slide a wedge of lettuce to the top of the skewer then add the tomato, onion, avocado, bacon, another iceberg wedge and finally the cucumber. Serve garnished with blue cheese crumbles, blue cheese dressing, and sliced green onions. What kind of dressing is on a wedge salad? Traditionally a wedge salad is made with blue cheese dressing, but you can also use ranch dressing, thousand island dressing or whatever meets your families likes. 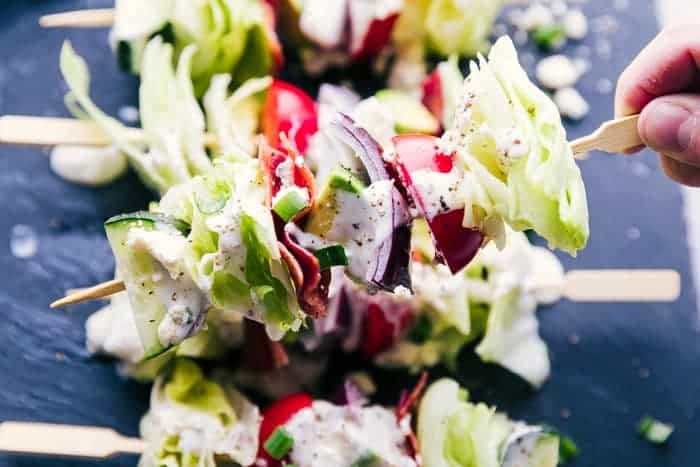 Wedge salad skewers or often referred to as “salad on a stick” make the perfect party appetizer or a great idea for a salad bar for people to create their own wedge salads. How do you cut an iceberg wedge? Using a whole head of iceberg lettuce remove any outside layers that are wilted or thin. Bang the core or heart down on the counter, then twist it and remove. Slice the lettuce into quarters, then cut each quarter horizontally down the middle in half. Cut each half vertically into small wedges and use for your salad skewers. How do you eat a wedge salad skewer? 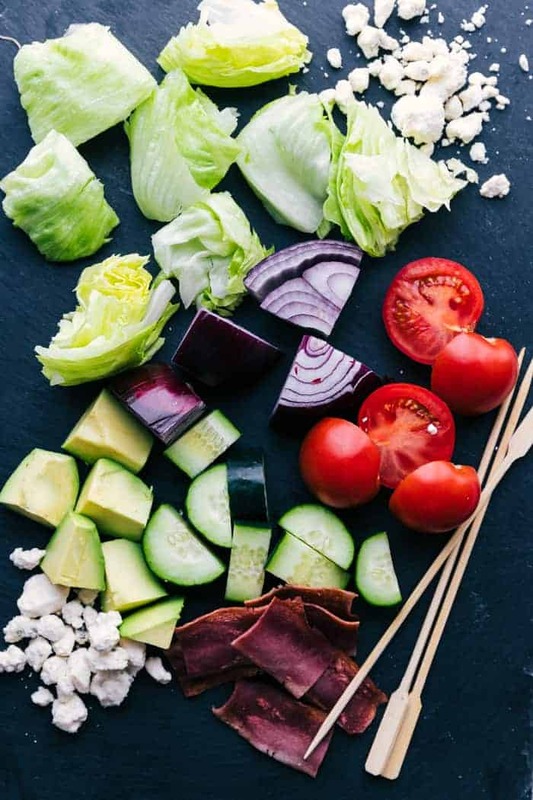 The easiest way to eat a wedge salad is right off the skewer or you can remove the salad from the skewer to a bowl or plate and eat it with a fork, like a traditional salad. 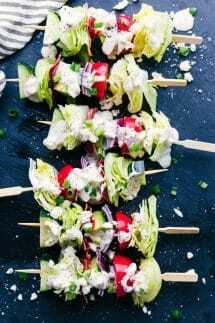 So for your next party, family get together or future cookout make salad fun and serve it on a stick with these adorable wedge salad skewers. One skewer at a time add an iceberg wedge, tomato, onion, avocado, two pieces of bacon, another iceberg wedge and then cucumber. Continue until all skewers have been made then garnish with crumbled blue cheese, blue cheese dressing, and diced green onions. 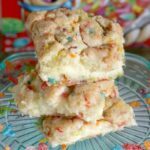 These are always a hit at parties! Such a fun way to serve a salad and everything on that skewer is so good! I am in love with these! Perfect lunch ideas. 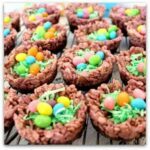 These would disappear in our house! Healthy and yummy! This is the best idea ever – perfect for parties!! !